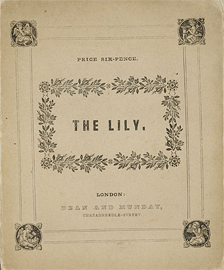 The lily, or, Little William and his mamma ; and, The good children. First sentence: "The daisy peeps out Of its pretty green bed, And the buttercup, yellow and gay, Above the soft grass High raises its head, And shines through the bright sunny day." Date of publication range found in Philip A. H. Brown's London Publishers and Printers c. 1800-1870, p. 55. Copy in McGill Library Rare Books and Special Collections: buff wrappers; coloured wood cuts. text.chapbook.black and white, 14 x 11 cm.